Computing has moved from on-premises to the cloud, and now, to the Edge. Data volumes, driven by the Internet of Things (IoT) and mobility are staggering, with projections as high as 847 ZB by 2021. 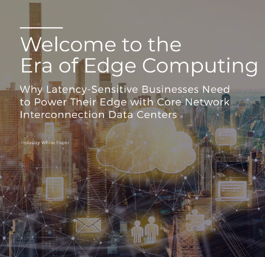 This data explosion has resulted in the emergence of Interconnected Edge Data Centers to support the ultra-low latency and intense data processing needs of today’s businesses. As customer demands for speed, analytics and access grow and accelerate, so too must your infrastructure. We invite you to download our new white paper, Welcome to the Era of Edge Computing, to assess the most appropriate interconnection platform for your business and build a modern and sustainable infrastructure.